The Society of the Lees of Virginia is comprised of descendents of Richard Lee, The Emigrant. Richard Lee came to Virginia in 1639 to be Clerk of the Quarter Court at Jamestown. Richard Lee emigrated from England to Virginia 1639-1640. Records show that he was holding office soon after his arrival. He acquired much land, held many high offices and in 1651 was elevated to the Council, the supreme governing body of Virginia. Not long after his arrival he married Anne Constable, a ward of the Governor, Sir Francis Wyatt. Richard and Anne Lee raised eight children: John, Richard II, Francis, William, Hancock, Elizabeth, Anne, and Charles. Richard Lee’s will directed that his property at Stratford, England be sold, and that the proceeds be used to discharge his debts, to complete the education of John and Richard at Oxford, and to provide dowries for his daughters, Elizabeth and Anne. In Virginia, he left the Machodoc plantation to his son John, the Paradise plantation to Richard, "War Captain’s Neck" to Francis, and the Maryland plantation to William. The Dividing Creek plantation he left to his widow for her lifetime and afterwards to be divided among his younger sons, William, Hancock, and Charles. John Lee died unmarried, in 1673. The Machodoc plantation then passed to his brother Richard, as their father’s heir-at-law. Hancock was married to Mary Kendall and secondly to Sarah Allerton. He inherited the southern third of the Dividing Creek plantation and became the progenitor of the Ditchley branch of the family. 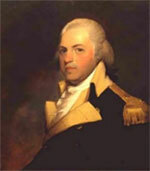 Charles Lee, the youngest son, married Elizabeth Madestard and inherited the middle third of Dividing Creek plantation, including his parents’ home there. His descendants make up the Cobbs Hall branch of the family. Richard Lee II married Letitia Corbin. Four of their sons – Richard, Philip, Thomas, and Henry – became, respectively, are the progenitors of the Mount Pleasant, Maryland, Stratford, and Lee Hall branches of the family. Their only daughter, Ann, married William Fitzhugh. She also has many descendants. Richard and Letitia are buried at the Burnt House Cemetery near Hague in Westmoreland County, Virginia. "That these United Colonies are, and of right ought to be, free and independent States, that they are absolved from all allegiance to the British Crown, and that all political connection between them and the State of Great Britain is, and ought to be, totally dissolved." Henry Lee, the youngest son of Richard and Letitia Lee, married Mary Bland and their youngest son, Henry II, as legend has it, won the hand of the "Lowland Beauty", Lucy Grymes away from his friend, George Washington. In any event, they remained close friends throughout their lives. Henry and Lucy Lee made their home at Leesylvania, near Dumfries, Virginia and their descendants are known as the Leesylvania Line of the family. The eldest son of Henry II and Lucy Lee, Henry III earned the nickname of Light Horse Harry (pictured below), for his exploits during the Revolutionary War. After his first wife Matilda died, Henry III married Anne Hill Carter. Together they had six children: Algernon Sidney who died at 15 months old, Charles Carter, Anne Kinloch, Sydney Smith, Robert Edward and Catherine Mildred.